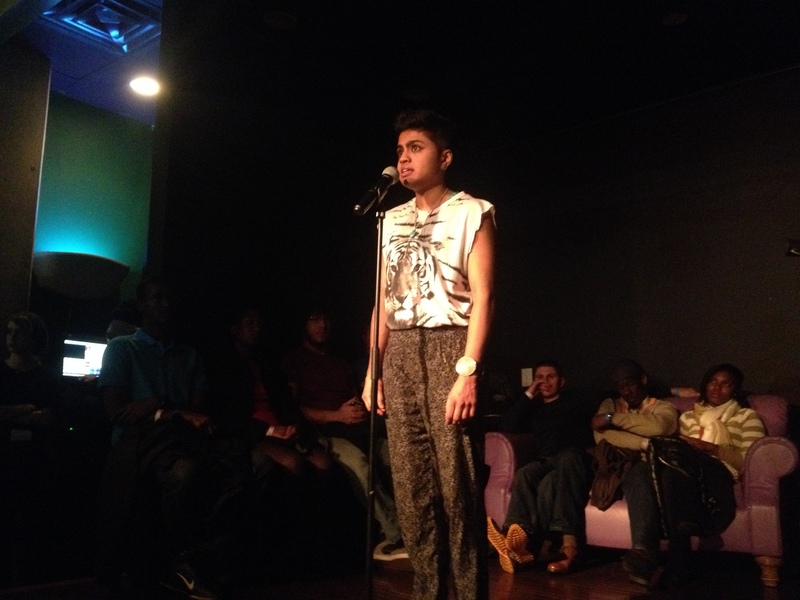 at my Busboys and Poets Wednesday night open mic we like to write a community poem involving everyone in the audience. we pass around the paper starting in the beginning of the show and everyone adds a line, so that by the end of the show we have a poem that we wrote together. this is that poem for Wednesday, January 15, 2014 at Busboys and Poets 5th & K Open Mic featuring Janani Balasubramanian (pictured below). Shrimp and grits are good to Me! This winter weather, I love it. Now let’s get loud like a trumpet. This pomegranate lemonade is the bomb dot com! And drinking the DC tap water, you can’t go wrong. Ready for this amazing art to ART! voices and passions silenced by the status quo. A love I wish lasts from now until the end. of love a tree, breathe blown out for you & me. all different colors, created unique. insanity from the pressure of poverty psychologically. can get to the end, yet I feel one must take their time. their feature performance was soooo on point. hilarious and deep and all sorts of other feels. very good night. ’twas so packed we had to seat people on the stage. Next Post Finalist in Harvard’s Pluralism Project Photography Contest!